Yesterday became a reminder of the special experience that this year has become. I didn’t really plan on it, but as they say, I was in the neighborhood. In the nature of adventures, that’s what made the exploration even more memorable and valuable. On Friday morning, I had the opportunity to watch the launch of the Japanese H-II HTV-6 cargo transfer vehicle to the International Space Station from JAXA’s Washington DC Headquarters. Of course, this was a special privilege to be able to share the excitement with the U.S. office of JAXA; I was also honored that the staff was able to find a place for me to attend. I’m not sure they initially understood my enthusiasm for the launch as a rocket scientist, and not just a representative of the State Department, but after some discussions of orbital approach velocities and the functions of the GC, PAO, and PHALCON consoles in the ISS, I think my excitement was clearly interpreted as longstanding and real. Having completed that activity, and then walking over to my office at the State Dept., it was time for some research. The children playing at the interactive wall couldn’t hear the voices. Maybe not yet. But the power of the moment came a few minutes later, as I realized: it’s here. Friendship 7, just a few paces away. Surprisingly, there were only a few people there, providing me more than enough time to feel the prick of tears, appreciate the bouquet of memorial flowers, and recognize the sacred touch to my core. Figure 3: Friendship 7 at NASM, with bouquets. For years, I had thought that I was supposed to be like John Glenn. I wanted to be an astronaut, no? And there he was, not a fictional creation, but a real person. That’s achievable, right? That’s the model of what an astronaut can and should be? Well, not quite. 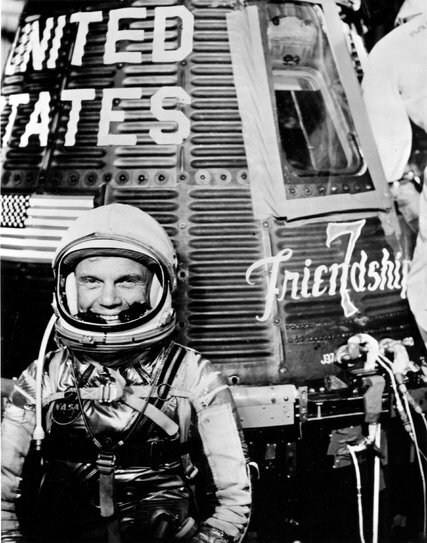 Even the other Mercury astronauts didn’t live up to the image of John Glenn, a story of love and good behavior as an icon that only pushes down further on the scales of history. That’s not what or who I am, though I deeply honor someone who could be so completely that person: even meeting him years later, well after being Senator Glenn and the crew member responsible for the Space Shuttle moniker “Discovery 7”, I had a sense that he was just being himself. And yet there is a lesson in there for me, even if I cannot be that person. In lab meeting this past week, GROUPERs and I discussed the future of the lab, and what would best achieve the goals I have for myself and the remainder of my career. In essence, my query and fear was over a lack of effect or impact. And yet, I can recognize that my best work is done when I am most devoted to doing what I am built to do, what lives at the depths of my core. There is a lot I “can” do, in the sense that I have a range of skills and aptitudes. But just because I can do it, that doesn’t mean that is what I must do. For some tasks, not only are there others better suited for it, but I am not ideally suited to do it; it would take away from what I am best designed to do. I wasn’t really ready for what I heard next (but I want to let you know that I am learning to hear these voices, too). GROUPER doesn’t recruit in a standard way. It’s not about ranking applicants on the basis of grade point and GRE scores. It’s about detecting “signs of life,” as I describe it. But, from the other side, that of the students who thrive best, there seems to be something else. It’s about someone who listens, and cares, and is passionately able and willing to alter the trajectory of one’s life. That is something I love to do, burn to do. It’s not the most lucrative choice, or the one with the most fame or adoration associated. How many people have I affected in this way? All of my estimates are too low. I undercount my effect in the lab now. I undercount it among the lab alumni (but maybe I should start coming to visit you, just for a day or two, and have another conversation with you and those who you think might be good for me to talk to), and among the students in class who go about their lives in some different way because of something they saw, or heard, or felt. In more mature consideration, I realize that the real reward is to be doing what I need to be doing for its own sake, not because of the external acknowledgements or rewards. Doing what one was built to do, out of a sense of duty to a broader purpose… a passionate life. Defining one’s work, and one’s job, differently than just being based on an income, but by being able to touch others and having left the world better. That’s perhaps not a common framing of holding, or doing, one’s job… but common or not, this sense of purpose was part of Glenn’s holding a job. Doing what Glenn did, because he did it, isn’t the point. Doing what I do, because it is what I should be doing, is. All the flags are at half staff today. But I don’t feel like I’ve lost someone. I feel like I’ve gained. I welcome the reminders, the tears and the passion, and most of all, the voices.